Sometimes all the what-ifs lead to creative breakthroughs, and sometimes they just set up roadblocks to making. If you chase every possible path, you’ll never get anything done. After finishing the checkerboard border, I had lots of choices available. The size of the center (center block plus the border) was odd, something like 19.75″, and it would have been awkward to add a border of regular square blocks at that point. I could have added a spacer border to make a an easier fit, but I wasn’t happy with the sizing that would have required, either. And I would have needed a plan for type of pieced border, so I could choose the spacer border width. At least it let me get started. After the dark blue and bronze checkerboard, I wanted an edge of salmon. From a construction standpoint, the narrow border would stabilize the piecing, since the checkerboard squares finish at 1 1/8″. 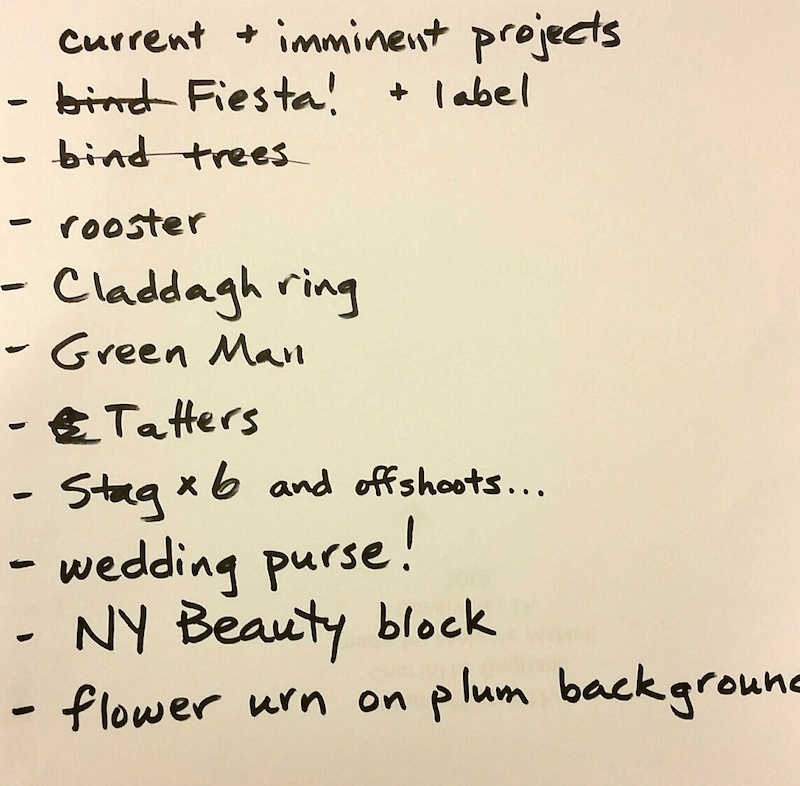 From a design standpoint, it would repeat the color of the rooster’s feet and eyeball, and refer to the background coral (mesh-like print) and the rooster’s comb and wattle. 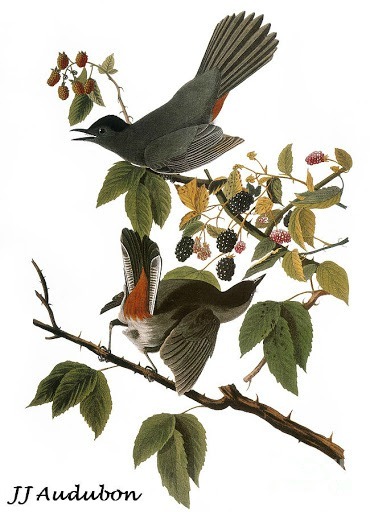 It would brighten the composition with the accent, and give separation from another, darker border. I had already chosen a blue for the last border. It’s the same color as the blue on the chicken, but rather than a random-looking stripe slashing across it, it has a very fine cross-hatching of black and off-white, suggesting plaid. The regularity of design repeats the regularity in the checkerboard, but of a completely different scale. I drew a simple shape to appliqué, thinking I could just repeat it a number of times around the edge. After digging through lots of fabric, I chose a dark toffee color with a brown leaf print. I pressed fusible web onto a small piece of it and cut out three of the shape. The shape is either an X or a +, depending on orientation. With the size I cut it, there is only room for it as an X. 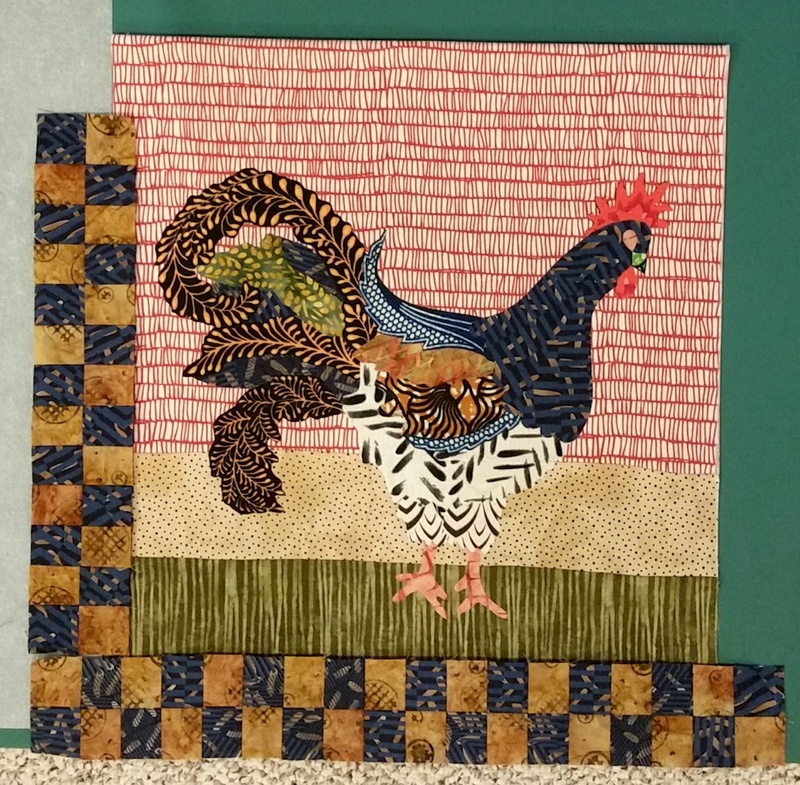 This entry was posted in Creativity, Quilting and tagged Applique, Art quilt, Borders, Design, Design-As-You-Go, Folk art quilt, Original design, Process, Progress, Rooster on August 18, 2018 by Melanie McNeil. Joanna commented on my last post that it was an interesting bait and switch, titling the post with “Rooster” but blogging about geese. Yeah, that was not really on purpose. By the time I finished showing you the flying geese quilt top, it seemed like a big enough post already. This one is actually about the rooster. Though I put a couple of recent photos in Instagram, when you last saw it on the blog, I’d assembled portions of the appliqué but had not fused it all together. Here it is, both before and after being fused to the background fabric. Click either picture to see them bigger. It’s worth spending a moment here to talk about execution. Over the last few months, I read a lot of different blogs and tutorials about fused and other machine appliqué. For me it was like reading a lot of recipes for one type of dish, and then making my own plan based on what I’d learned. * I used Wonder-Under brand fusible web. Honestly, I haven’t tried more than a couple of brands, so I can’t tell you how it compares to other types of fusible. 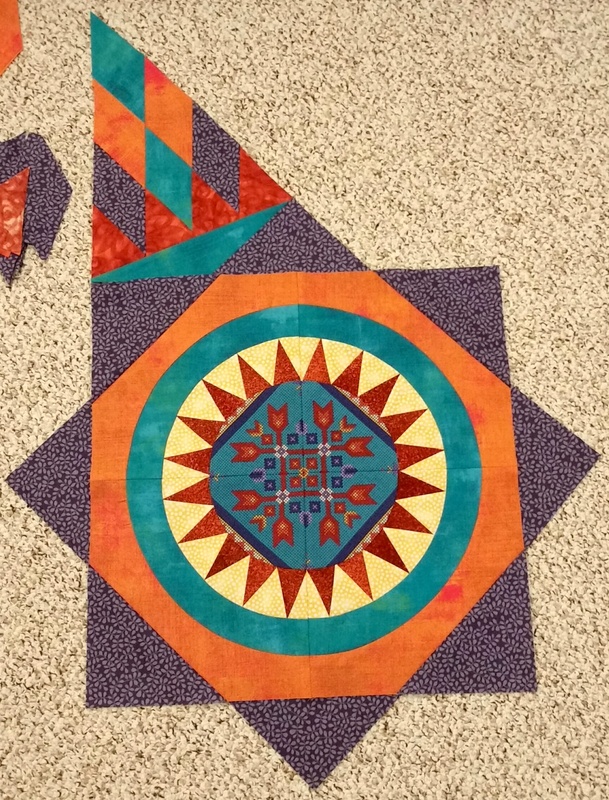 * For some of the larger pieces, I cut the centers out of the Wonder-Under before fusing to the rooster fabric, leaving just an outline about 1/2″ wide. That reduced the heft and stiffness of those pieces. * I fused small components together to make bigger parts (shown in the photo above,) using parchment paper as my pressing sheet. Once the pieces are pressed together, they can be peeled off as a group. Some people recommend Teflon pressing sheets, but I used parchment paper; it worked fine and it’s very inexpensive. * Previously I’d drawn an outline of the rooster on tracing paper, along with a couple of marks to show where the background seams were. That made it easier to place the big parts when I was ready to fuse to the fabric. However, I purposely oriented the rooster a little less upright than my original drawing. That was easy to do since I hadn’t fused all the parts together yet. After attaching the full rooster to the background fabric, I tried a lot of ideas for how to frame it. Initially I figured to create a narrow line of dark coral, all the way around, and then bordering that with hourglass blocks. None of the color combinations I tried really rocked me. One question seemed worth pursuing: what if I made a checkerboard border? What if I used three layers of checkerboard, like 9-patches? Or maybe simpler, just 4-patches? Again I auditioned colors. I chose a bronze batik (used in many other projects, and I’ll be very sad when it’s gone) and the same blue print used for the rooster’s head. The finished patches are 1 1/8″ squares. Rather than work with the tiny pieces individually, I used strips of blue and bronze, cut along the grain for better stability. If you cut across, width of fabric, you can get substantial bowing of the pieced strip. That’s my progress so far. 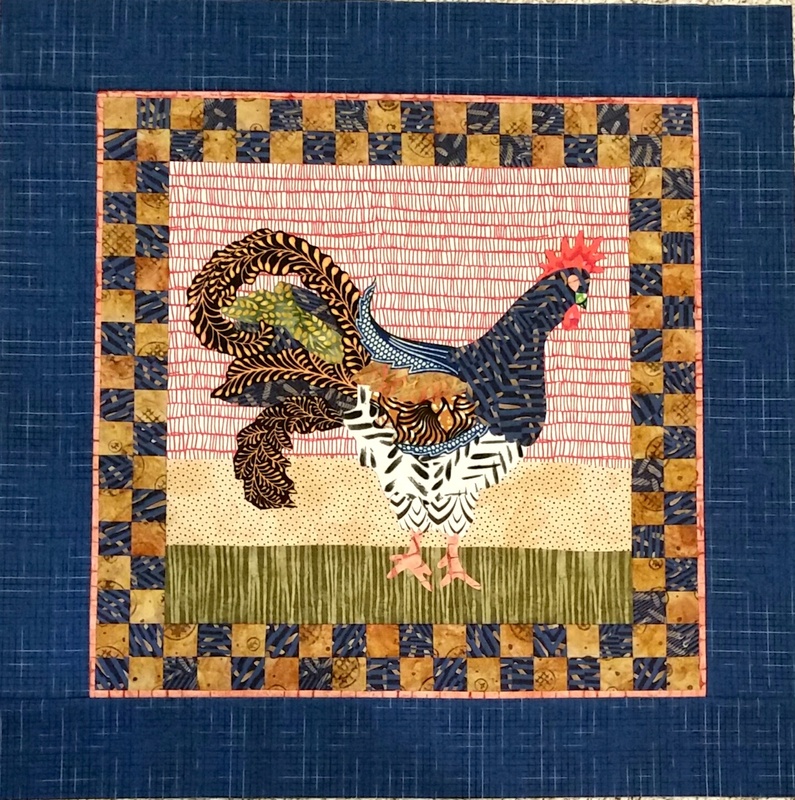 This entry was posted in Creativity, Medallion Quilts, Quilting and tagged Applique, Fused applique, Process, Progress, Rooster, Work in process on August 13, 2018 by Melanie McNeil. For the first week or more after returning home from travels, I didn’t get into my studio, except to do a really minor project for Jim. My hiatus of about a month left my quilting “muscles” wimpy, so I eased in by sewing a label on a baby quilt and making a pillowcase for the baby’s older brother. After those were done, I still wasn’t mentally prepared for anything very hard. I decided to pull out my stack of flying geese, made before the end of last year with the intention of creating a strip quilt in pinks and browns, with the addition of teal and dark red. 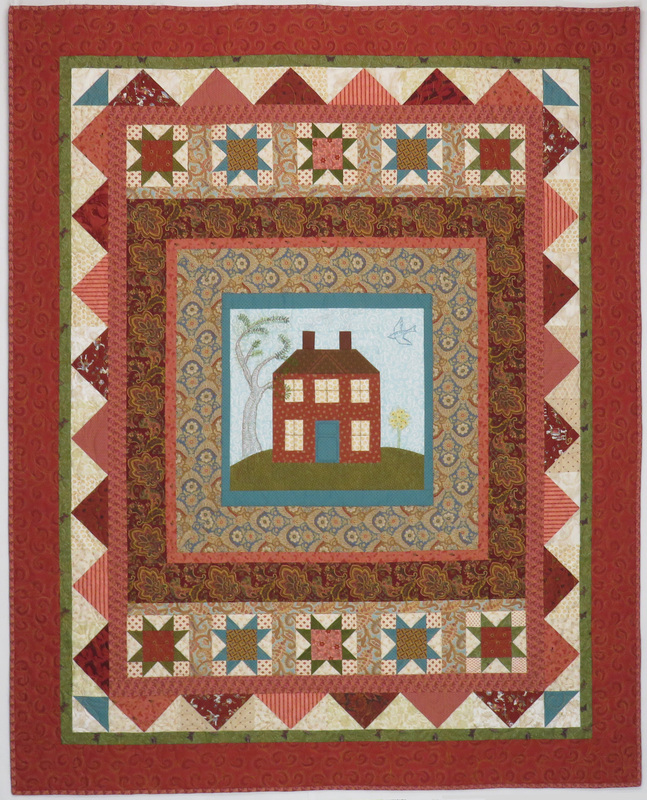 If you remember, that “strip quilt” became a medallion, centered by a house. But there were 88 flying geese, still plenty to make a strip quilt! I could split them into four sets. The geese finished at 3″ x 6″, so a strip of 22 geese would be 66″ long. Nice size for a big lap or couch quilt. The trouble was, I would need strips to put between the geese, and then something else to use as borders. I’d have to buy something or do a lot more piecing. Honestly, I just wasn’t that into it. After moaning to Jim a bit about the math, the sizing, how it would be to make blocks instead of strips … he said something like, can’t you just sew them all together? Because I can’t give up the math completely, I figured that my 88 geese would go together in pairs, to make 42 blocks finishing at 6″ x 6″, with 4 geese left over. I sewed them into pairs and then started arranging. This was the finished top, with edges cropped in the photo-taking. I found fabric for the back and cut binding strips. After I quilt it later in the month, I’ll donate it through my guild for the VA hospital. 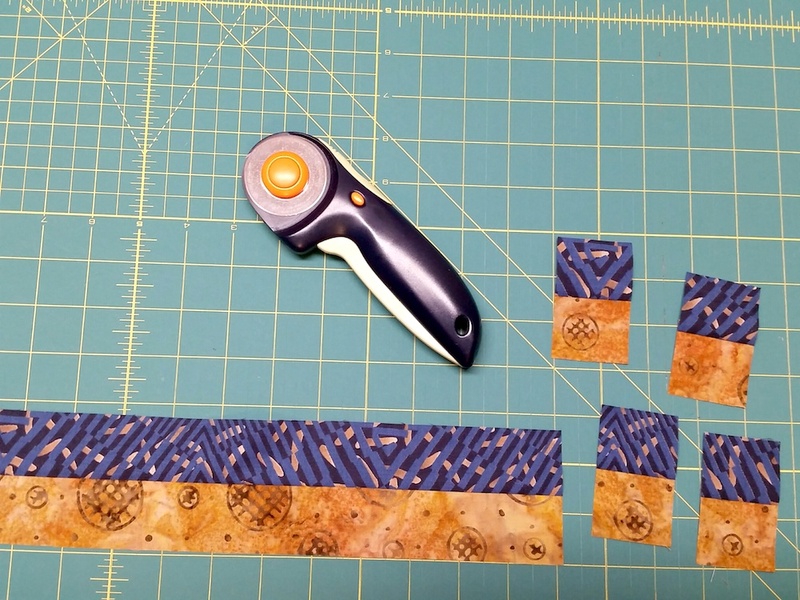 This entry was posted in Creativity, Quilting and tagged Flying geese, Progress, Strip quilts, VA hospital quilt on August 9, 2018 by Melanie McNeil. Some old buildings fascinate me. I love the lines of old train stations, small-town Carnegie libraries, and one-room school houses. For many years I’ve fantasized about turning a school building, of the style common in the Midwest and seen in television’s “Little House on the Prairie,” into a home. These buildings hold a different romance for me, and I wanted to make one for myself. About mid-way through creating the top, I posted about it (and thoughts on the term “improv”) in this post. And more about it here. In the photo below you see the center framed four times, through the dark red paisley. 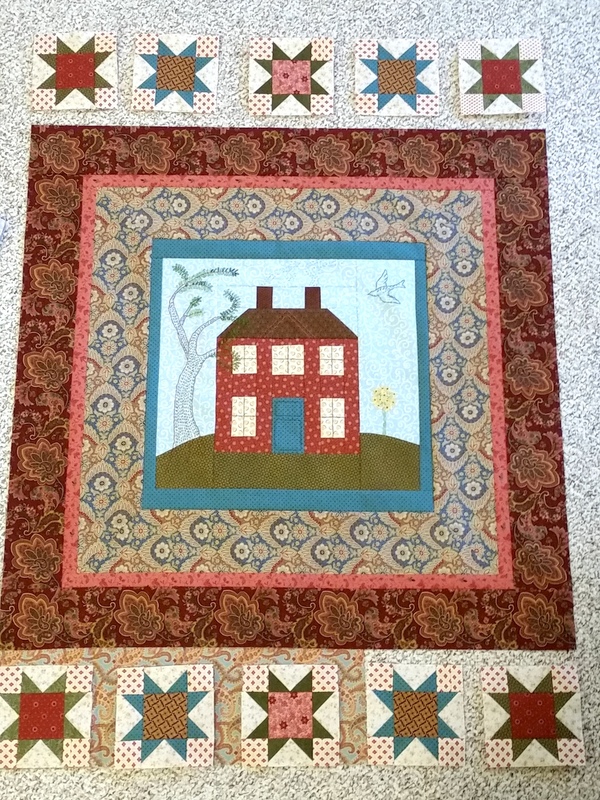 I could have maintained the square shape with the rest of the borders, but elongating the quilt would emphasize the tall, narrow shape of the school. To lengthen the shape, I added borders to top and bottom. By mid-March I had the top finished, including a bit of additional embroidery. By the way, I loved doing the embroidery! It was free-style, improvisational all the way, with no hoop. There is more embroidery in my future, no doubt! The finished quilt pleases me enormously. The Old School House. 51″ x 64″. March 2018. Photo by Jim Ruebush. 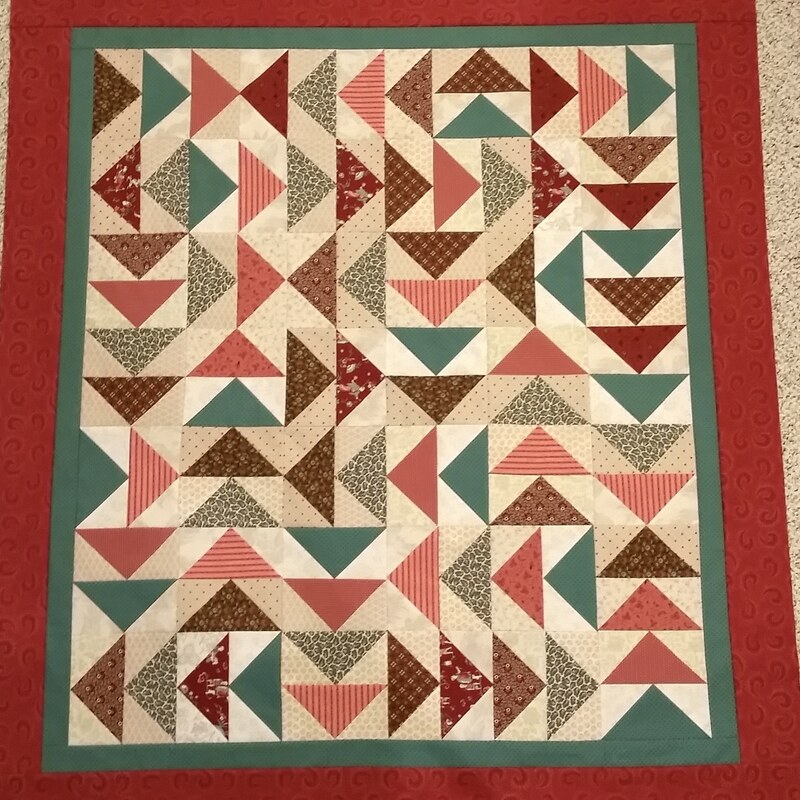 Though I had several dozen flying geese in double pinks, reds, browns, and teals, (after all, the quilt was supposed to be a strip quilt of geese, not a medallion quilt with a house,) I opted to simplify the colors by using only pinks and reds. Using a wide variety of fabrics for them makes them a bit more interesting. With all the warm colors, I chose to repeat the cool colors with the teal triangles and the olive green narrow strip, as well as in the star points. Notice how simple this construction is! The only obviously pieced borders are those with stars and with geese. The rest are plain strip borders. (The print second border, just outside the line of teal, is actually pieced in many places, as I eked out the length from scraps.) No one needs to be an expert to make something like this. They just need to know how to make things fit well enough to lie flat. As with Fierce Little Bear, some of the detail is in the quilting, rather than in the piecing or format. I used white thread to create some airy detail in the sky, and green to draw more wispy leaves around the tree and to expand the globe of flowers on the right. The roof got lines in rust, and the window details were emphasized with the texture of pale golden tan thread, similar to the window backgrounds. I also quilted lines across the house in the manner of clapboards. Click on any picture to open the gallery for a closer look. I’ve been enjoying my projects so far this year, both those finished and those still in process. I’ll keep sharing the finished ones as I get posts written, though in truth, I’ll probably skip writing about the VA hospital quilts. 7. Where Are the Birds? This entry was posted in Medallion Quilts, Quilting and tagged Design-As-You-Go, Embroidery embellishment in quilt, House medallion, House quilt, New England sampler style, Original design, Process, Progress on June 22, 2018 by Melanie McNeil.